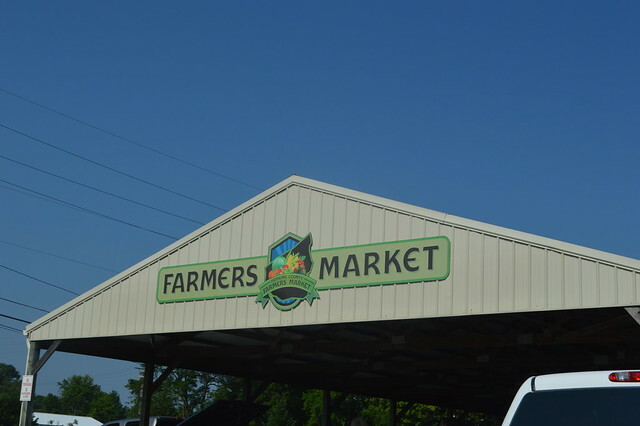 MADISONVILLE, Ky. (6/17/18) — Family Fun Day attracted people to the Hopkins County Farmers Market for a variety of activities and fresh goods ranging from baked bread and beef to pickles, blueberries and honey. Market Manager and owner of Pond River Farm, Bunny Wickham, said local producers are offering different activities through the season. Next month, producers will host Farmers Market Appreciation, and September is set to focus on Health and Wellness. “We are trying to have different activities to boost attention and draw more people to the Market,” Wickham said. Farmers Market boasted lots of free children's activities including temporary tattoos, face painting, plant-a-seed and sidewalk chalk Saturday. All the usual market items and vendors offered honey, fruits and vegetables, baked goods, Rooster’s Beef, breads, pickles, essential oils, blueberries and more. “We have just about anything you could ask for at the Farmers Market,” Wickham said. Farmers Market is open 10:30 a.m.-4 p.m. every Wednesday and 7:30 a.m.- noon each Saturday. The stand is located off East Arch Street near the fairgrounds in Madisonville.